Welcome to the first ever Round Table Round-Up, where we highlight topics and ideas discussed in a recent AnimeChicago Round Table. This article covers director Satoshi Kon’s television series Paranoia Agent. As pointed out by Neil, our discussion moderator, Paranoia Agent was formed as set of experiments based off of story “scraps” that Kon had previously written, but never used. However, despite the nature of its creation, most discussion members felt that Kon’s construction of the show was very coherent. Still, there was some contention in the group about the nature of episodes 8-10, where some members felt that these episodes, were unnecessary because they didn’t advance the plot, , while other members were more supportive of the episodes, feeling that they contribute to the overall tone and style of the series. Either way, most members felt that the series was easy to follow while still maintaining a high level of complexity. Some members were surprised that Paranoia Agent once aired on Adult Swim, not only for its structure, as previously mentioned, but more importantly for its subject matter. Discussion members found the series to be both seriously critical of 90s Japanese culture and unexpectedly humorous, even when it shouldn’t be. Members pointed to the series’s opening sequence as a good example of Kon’s criticism, in that it shows the characters of the series laughing in front of numerous natural and manmade disasters, including a nuclear explosion. Furthermore, episode 8 (“Happy Family Planning”), takes a very serious subject – suicide -and turns it completely on its head, and some members found themselves laughing at things they would have not in any other situation. That isn’t to say that all subjects and sub-plots were welcome amongst the discussion members. Members found a few story arcs to be cliche at best and at worst offensive. Members specifically pointed to episode 6 (“Fear of Direct Hit”), in which a corrupt police officer goes so far as to place hidden cameras in his own daughter’s room. Some felt that these scenes may have been added to match the tone that many late-night anime series from the late 90s had. Many felt that the series wouldn’t suffer with the exclusion of these scenes. Paranoia Agent was produced during the post-Evangelion “wave,” where many late-night anime airing at the time were attempting to be as introspective and “deconstructive” as Evangelion was. 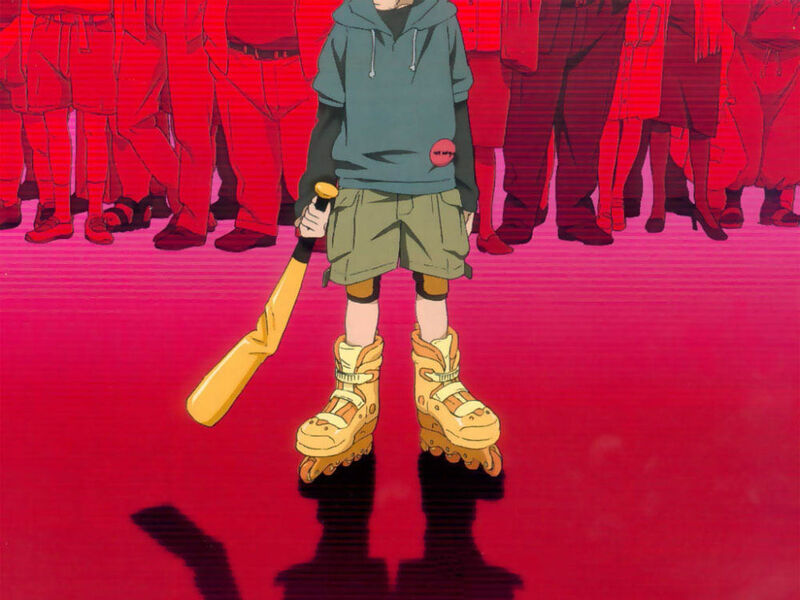 Almost all members at the discussion agreed that while most series produced at this time failed to hit the mark set by Evangelion, Paranoia Agent excels. Members also found that the lack of budget is unnoticeable for most of the series, and that Kon’s editing most likely contributed to this. Some members commented that the staff that produced some well-crafted scenes. The group also discussed the general themes of Paranoia Agent. Many found that the series used symbols of late-90s Japanese culture to illustrate the level of escapism plaguing the country at the time. The two central symbols of the series, Maromi and Shonen Bat, can be boiled down to depictions of safety and chaos, and both are used by the characters as excuses for the actual problems haunting them. Additionally, characters can be seen as devolving into, or being defined by, their symbolic nature. The two characters that the group felt inhabited this best were Yuichi and Radar Man. Yuichi, a young boy introduced early in the series, represents the “ideal” Japanese youth, and defines himself as such. It’s only when Kon allows us to spend some time with the character that we see that the underlying “ideal” is just a veneer. Radar Man, on the other hand, is the superhero alter ego of young detective Mitsuhiro Maniwa, who sees himself as the only man capable of solving the mystery around the Shonen Bat attacks and ending the mass-delusion that has spread across Japanese society. Yet, Kon depicts him in both his internal ideal, as the hero he believes himself to be, and as the seemingly crazy person he truly is at the time of his “transformation”. Other characters, though not as much symbols themselves, also succumb to their own illusions and shape their lives around symbols. As the group agreed, this is best represented by Maniwa’s older partner, Keiichi Ikari. Halfway through the series, Ikari gives into his version of post-World War II Japan. Like many romanticising the past, Ikari only sees this era of Japan in a nostalgic light and fails to acknowledge its true nature. This part of the discussion ended up with many members agreeing that the ultimate theme of the series is that the characters, and seemingly Japan as a whole, are not facing the reality around them and that there is no end to the delusion. Every character in the series, except for one notable example, has some method of escape and uses it when faced with harsh truth. The one character that does face reality, Ikari’s wife Misae, does so in what most members agreed was the possibly the most powerful scene in the entire series, in which she fights back against the city-wide delusion through pure willpower Members enjoyed the psychological battle between her and Shonen Bat. On a whole, the discussion group rated Paranoia Agent positively, with mostly 7s or 8s out of 10. Some felt that the series felt a bit dated and that the animation was lacking. Others appreciated the series’s unconventional storytelling and direction. Ultimately, Paranoia Agent provides a surprising amount of depth and entertainment in such a small number of episodes and is worthy of a nice discussion.